Hello my name is Mark Dixon, I am a fully qualified Government Approved Driving Instructor (ADI). I provide intensive and semi-intensive driving courses as well as individual driving lessons in both manual and automatic cars using the unique LD System of driving tuition. I became a driving instructor because I wanted a job with real satisfaction and after over 40 years of driving experience, I would like to pass on my experience and knowledge by using the LDC system along with my patient relaxed personality. Nothing gives me greater satisfaction than people passing first time and knowing they are safe and competent drivers. I have been told by friends and work colleagues in the past that because I am calm and relaxed I would make a great Driving Instructor so they were not surprised when I let them know I had chosen this profession. In addition to my driving experience, I have many years of experience in coaching and motivating people to be the best that they can be. I am a happily married family man with children and step children ranging in age from 16 to 44 as well as five fantastic grandchildren so I would like to think I am a good communicator and can relate to people of all ages which is a great advantage when teaching people to drive. I was fortunate to be trained by LDC in the latest adult coaching and training techniques so you can be assured the training I give will be of the highest standard. 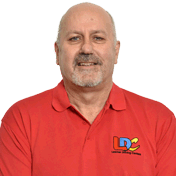 I chose to work with LDC because every person is an individual and the LD System allows for flexibility in lessons so if you choose me, you will learn to drive safely at a rate that suits you. In addition, I aim to make every lesson enjoyable and as productive as possible. The LD System just helps me to do this more effectively and ensures there are no gaps in your training. Finally, all lessons are conducted in a calm, friendly and relaxed manner as I firmly believe in making pupils feel at ease during lessons. If you would like to discuss things further you can call or email. If I am out giving a lesson, I will get respond as soon as I have a break.